Using a vise to remove an armature bearing is one trick when conventional methods are not available. 1. Position the armature securely in the vise. 2. Carefully wedge pry bars behind the bearing. 3. Leverage the bearing off of the armature. 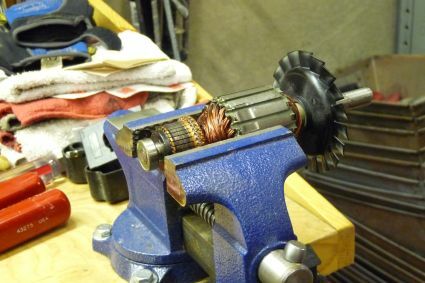 Armature bearings need to be removed from power tool armatures for a variety of repairs. Most of the time, the best way to remove an armature bearing is with a specialized tool repair tool called a bearing puller, but a good bearing puller isn't always available. A small vise is usually best for this repair, because the bearing will need to protrude past the length of the vise without the armature fan getting crushed at the other end of the armature. You will also need two small pry bars or flat head screwdrivers. 1. Position the armature body securely in the vise so that its bearing sticks out one end. 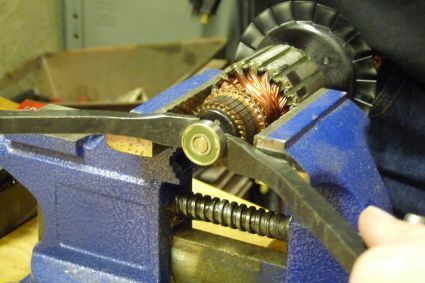 Make certain not to damage the armature fan in the vise. 2. Wedge your pry bars or screwdrivers carefully behind the armature bearing. 3. Apply equal pressure to both sides of the bearing, and leverage it off of the armature. Click this link to our Tools for Tool Repair page to see our selection of specialized repair equipment, like bearing pullers. eReplacementParts.com is here to give its customers the parts and know-how they need to get quality performance out of their tools and machines.